These retractable pens are ideal for keeping around the office or taking to school. 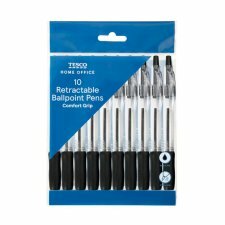 Supplied in a pack of 10, the black ballpoint pens write a 1mm line and feature a soft grip to ensure a comfortable writing experience. A handy clip allows each pen to be attached to a shirt pocket or clipboard.